Mary Ann Regouski, 73, of Abrams, beloved wife of 53 years to David Regouski, departed this life peacefully on Tuesday, January 29, 2019 at Crossroads West Care Center. Mary Ann was born on May 12, 1945 in St. Cloud, MN daughter of the late William and Elizabeth (Schreifels) Theis. She loved taking rides on her golf cart and playing with Sassy the cat. 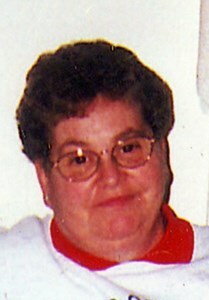 Mary Ann loved playing cards, and spending time with her family and friends. She will be greatly missed by her husband David and a son, Timmy Regouski. Mary Ann leaves a grandchildren: Lindsey, Nathan, and Melissa Regouski along with a mother-in-law, Muriel Freyslaben. She also leaves her siblings: Georgianna Holthaus, Kenneth (Dorothy) Theis, Lenore (Delroy) Mayer, and Robert (Jan) Theis. She also leaves several nieces, nephews, extended family and friends. She is preceded in death by a son, Terry Regouski. Visitation will be held on Sunday, February 3, 2019 from 3 PM - 6 PM at Newcomer - Green Bay Chapel, 340 S. Monroe Avenue, Green Bay. A rosary will be recited at 6 PM with parish prayers. A Mass of Christian Burial will be celebrated on Monday, February 4, 2019 at 11:00 AM at St. Maximilian Kolbe Parish, 6051 Noble Street, Sobieski. Burial will follow in the church cemetery. Mary Ann's family wish to express their deep gratitude to the staff of Crossroads West, Unity Hospice, St. Mary's Hospital, Bruce and Mary Bying and neighbors for the wonderful care and concern given to her throughout her final journey. To leave a message of condolence for Mary's family please click the Share Memories button above. Add your memories to the guest book of Mary Regouski. We will always remember Mary riding in the golf cart with David coming to our home. She beamed a big smile as she so enjoyed riding with her husband! Dale always enjoyed playing cards with Mary in the local tournament at Dale & Janes. We will miss Mary and her beautiful smile.